Ely to Bill Fen Marina, Ramsey - Ely Ouse, Tidal River Ouse, Middle Level - Well Creek. 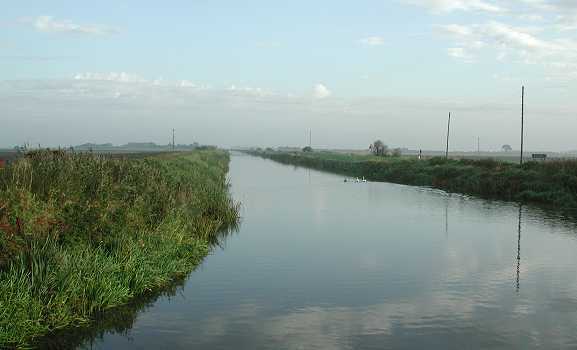 Old Course of the River Nene, High Lode as well as all of the main section of the 40 Foot Drain. 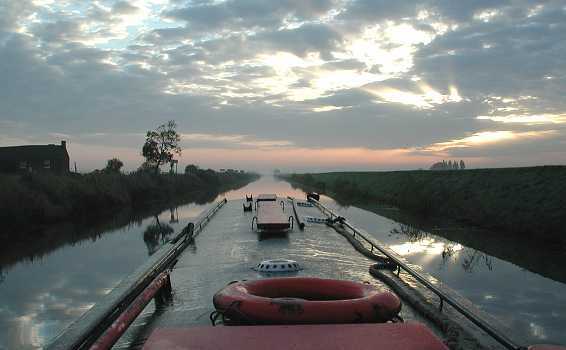 John Chapman's reason for trip - get the Frog Boat from Ely to Bill Fen Marina, Ramsey. Neil's reason for trip - To get under Ramsey Hollow Bridge and do the final missing bit of the 40 Foot Drain up to the Junction with the 16 Foot Drain! Neil got up at 04.30 and threw on some clothes and zoomed off in the Passat to pick up John Chapman from Luton. After a quick petrol and provisioning stop in the close to the river Ely 24 hour Tesco's, we managed to tear our selves away from the beckoning, £1.99 full breaky offering coffee shop. We quickly dumped the Passat in a local back street an managed an 07.40 start from Ely in the TNC Fleet Auxiliary - NB Frogmoore II. As predicted JC had lots of boaty "things" to do, so Neil was left as helmsman, in a slightly draughty wind, blowing over the Fens in a way that only Fenland winds can blow. Amazingly JC soon practised his hardly ever practised culinary art. Bacon sandwiches kept appearing, followed by numerous cups of tea and CAKES! - JC has a somewhat sweet tooth. Ely Waterside had been somewhat deserted and for that reason the local council were no longer concerned about the Frog Boat permanent riverside feature. The Fenland wind soon blew up even worse and the waves on the Ely Ouse became quite large - Neil was rather glad that he had remembered to bring his full winter boating togs. The Frog Boat was left in a slight state, due to the last crew being the junior Chapman's in full "partying" mode. There is reference in the log boat to "that grand old lady" - referring to Frogmoore, "putting up with our high spirits"! We had to be at Denver at 11.00 as that was the "Black art" locking time to Salter's Lode. Being this far inland, these times are not linked with the actual predicted tide time as there are many local factors, such as wind direction and fresh water flows on the Great Ouse / New Bedford River. Amazingly due a fair flow on the river we arrived..................exactly at 11.00! We had not seen a boat moving so far that day, but was amazed to find another narrowboat waiting. This was the NB Wandering Swan, from Brampton, owned and solo crewed by Ian Buchannan. JC soon ferreted out Mike Fairweather the Denver Locky and after a brief chat with him returned as the conditions meant that the locking would not be for another hour........which is nearer the time WE had predicted! The social JC soon had Ian on board and was making more tea / handing round yet more of his endless cake supplies. JC soon told Ian of our exploits and we found out that Wandering Swan, far from wandering very far from the Great Ouse, was to over winter in the somewhat cheaper than marina's on the Great Ouse - Fox Boat's at March. JC of course said that Frogmoore was over wintering at the even cheaper (and not full) Bill Fen Marina at Ramsey. Wandering Swan was to spend next season on the River Nene, we of course tried to inspire Ian to get up to the Grand Union. Eventually Mike shepherded us both in the lock at 12.00. 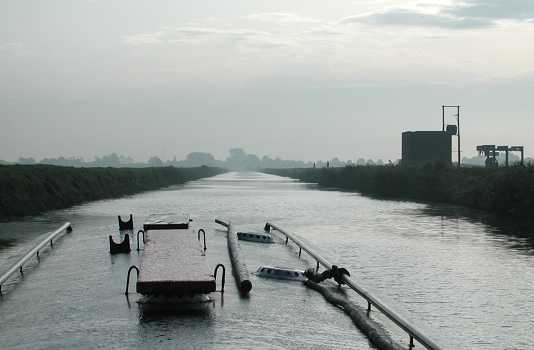 There was yet more delay as the Salter's Lode Locky had to pen out / flush out copious amounts of floating reeds. At 12.20 we were let out. As both boats were under 50ft we could get into Salter's Lode Lock together. 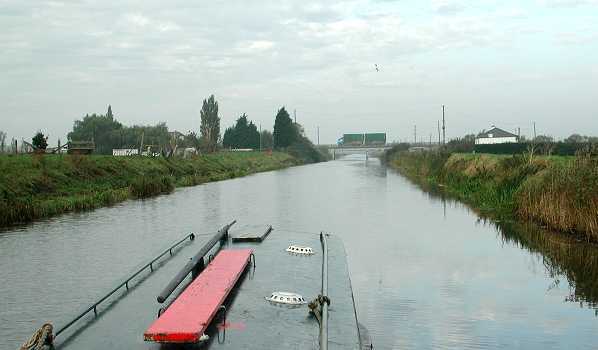 The Tidal Ouse was in flood tide mode, but with the amount of fresh that was about, it meant that we had an easy turn into the short, angled cut into Salter's Lode lock. JC did his "signature" weird figure of eight turn below the lock, allowing Wandering Swan in first - I have yet to work out if this was intentional! - anyway a very controlled entrance into the lock without touching anything. Paul the Salter's Lode Locky was off duty that day and we had a jovial, smartly boiler suited Middle Level Commissioners, Wiggenhall St German's Main Drain Pumping Station Pumpmeister. Neil enquired about the main Middle Level level (if you catch my drift!) He said that it was about 10 inches down from "normal" summer levels, due to water not being required for irrigation and in readiness for rain. This was winter practise. 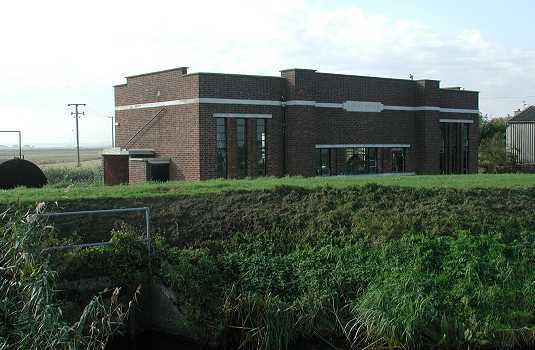 Neil also enquired about a possible visit to Wiggenhall St German's Pumping Station. The Pumpmeister said that people are sometimes shown around - best to get in touch with Mr Philips, the MLC Chief Engineer. Neil said that this would be better after he had forgotten the "Spectacles in Horseway Lock" incident! We hung around for a while to inspect the Old Bedford Sluice - the level seemed the same as when we passed through it. It was a slightly warmer and less blowy afternoon. 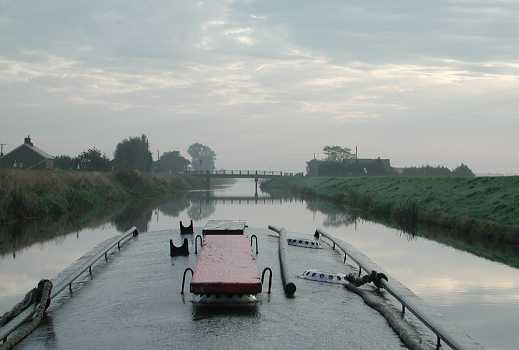 We left Salter's Lode at 13.00 and arrived at Upwell, on the Church Staithe at 15.00. The passage had been trouble free, all signs of summer weed having already disappeared / been fished out. Wandering Swan was on the stage in front of us, but when were awoke from our afternoon kip, it was gone. We had arranged to meet Greg Chapman in the Five Bells pub as being an inn and not Monday night we assumed it would be doing food...............it was NOT! After a pint Greg turned up and we stayed for a while longer as Tony Clarke was meant to be cycling over to meet us (of course, on his Moulton!) at "Dusk". It was long passed "Dusk", so we jumped into Greg's car to go up to Outwell and the good old Crown Lodge Hotel. JC rather cheekily left a message for Tony, with the barmaid, that the "canals" people had gone across to a pub that DID do food. Eventually Tony did arrive and we mini-GiGed until closing time. Greg discussed his latest plans for getting afloat and Tony told tales of yet MORE alterations to his boat! It was a threatened with rain but warmer day. We set off at 08.55, with the object of getting to the Ramsey area that night after a diesel / water top up at Fox Boats. At 12.15 we threaded our way into a rather full Fox Boats marina, where old Charlie Fox broke fitting out HIS latest narrowboat (complete with Lister JP3) to fill us up with diesel and sell JC a new barge pole, as Frogmoore's had been left on the top, in ELY and had disappeared. After a complete water fill up (so we were as low as possible for Ramsey Hollow Bridge), we wandered over to chat with the liveaboard couple friends of John - Ron and Joan. Being now somewhat local hero's we heard tales of the REAL hero's - John Shotbolt's (Bill Fen Marina owner) and the Peterborough IWA's valiant attempts to successfully open the end of the 40 Foot Drain / Welches Dam Lock / Old Bedford / Old Bedford Sluice in the 1980's. After many cups of tea we eventually tore ourselves away at 15.30. A now totally weed free trip along the River Nene Old Course followed. 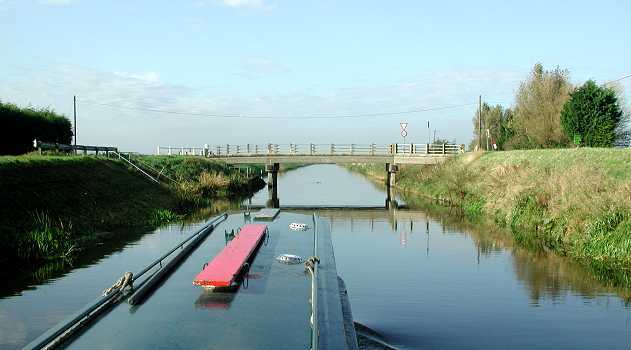 This was still perceived as being rather shallow, even for the Frog Boat at the end just before the junction with the deep and wide Forty Foot Drain. Being now rather late we decided to go up High Lode (to Ramsey) and spend the night beside "Wind in the Willows" - Ted and Jan's boat - just outside the entrance to Bill Fen Marina. We arrived here at 18.45 and then went on the cosy "Wind in the Willows" to talk to Ted and Jan. A JC prepared evening meal then followed, rounded up by a few night caps of whiskey left by the junior Chapman's and a rather serious discussion about the Middle East and other things. It was a very warm morning, even at 07.05, when we set off. At the junction with the 40 Foot Drain we trundled down it. Ramsey Forty Foot was passed (the village!) and soon we were at Ramsey Hollow Bridge. This saggy, one side dropped Bailey bridge, defeated the Earnest Team in the Summer, but with the level now some foot lower (as could be seen by the "watermarks" on the bridge piers) we easily got under it, even Neil's removal of the Frog Boat prone spot lamp would have been un-necessary. We flew along this deep and wide drain. Just before Leonard Childs Bridge Fenton Lode was passed. 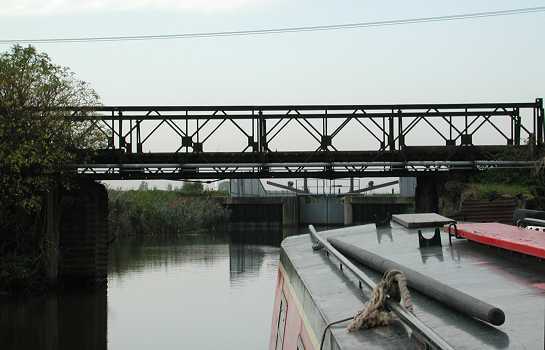 This did go to Chatteris and had always intrigued Neil, for it was shown on his 1980's O^S map as looking navigable. It probably was then, but a recent weir has been added just at the junction with the 40 Foot Drain. Beyond Curf Bridge the drain was in the process of being grubbed out by a drag line excavator, this was just about finished and we had an easy passage to the junction with the 16 Foot Drain / continuation of the 40 Foot Drain to Horseway Lock. Here at 09.30 we winded and the carried on back to Frogmoore's new mooring beside "Wind in the Willows" at Bill Fen. We were back at 12.10. Neil helped JC with sorting out a few niggling faults with NB Frogmoore. We also investigated the bottom of Frogmoore's diesel tank to see if this could explain the obviously bunged up fuel filter, that was causing now repeated hunting noises to the engine. The amount of crap and water at the bottom of the tank explained all this! We went to see John Shotbolt and he kindly lent JC a vacuum oil / crud siphon tank. The thin non flexible hose was used to good effect and a complete tank full of cruddy diesel and water was retrieved -------time to change your fuel filter AND carry a spare John???!!! After getting our COMPLETE Middle Level cruising plaque from the Shotbolt's we depart back to Ely for a car retrieval. This day coincided with a tree nursery visiting Linda and Mother-In-law, Micra propelled day out to Ely! Starting up the Forty Foot Drain. 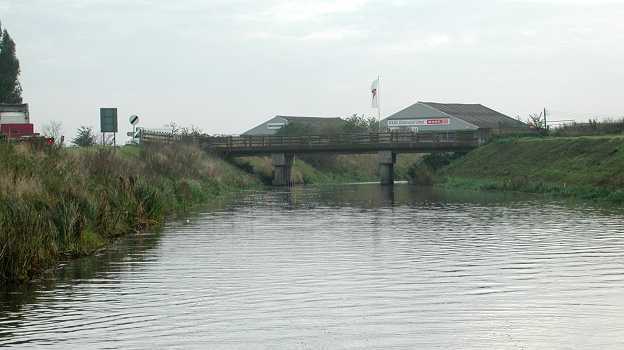 River Nene Old Course continues under the bridge to March. Middle Level. The have just left Ramsey Forty Foot. Forty Foot Drain. Middle Level. Puddock Bridge. Forty Foot Drain. Middle Level. Curf Bridge (A141). Forty Foot Drain. Middle Level. Nearing the end of the Forty Foot Drain. Nightlayers Fen Pumping Station to the right. Middle Level. 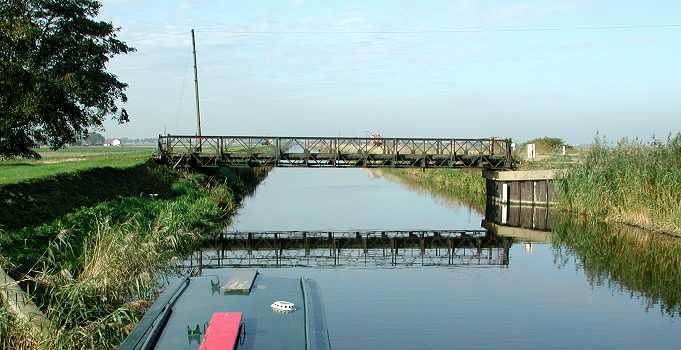 The Forty Foot Drain to Horseway and Welches Dam Locks continues to the right, the 16 Foot Drain to Three Holes goes off to the left. Middle Level. 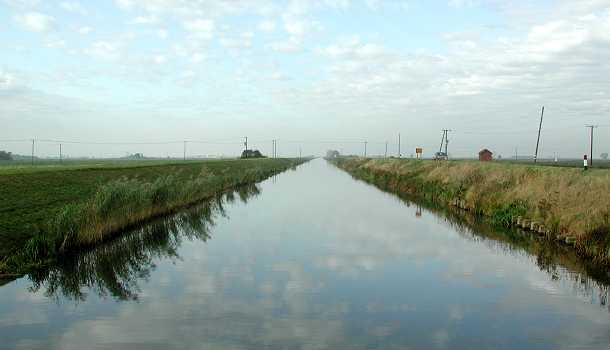 Looking along the 16 Foot Drain. Middle Level. Frogmoore II winding at the junction with the 16 Foot Drain. Forty Foot Drain. Middle Level. Coming back to Curf Bridge (A141). This is a new road on the course of an old railway line. Forty Foot Drain. Middle Level. Leonard Childs Bridge. Forty Foot Drain. Middle Level. Looking back at Leonard Childs Bridge. Fenton Lode is just to the right. Forty Foot Drain. Middle Level. 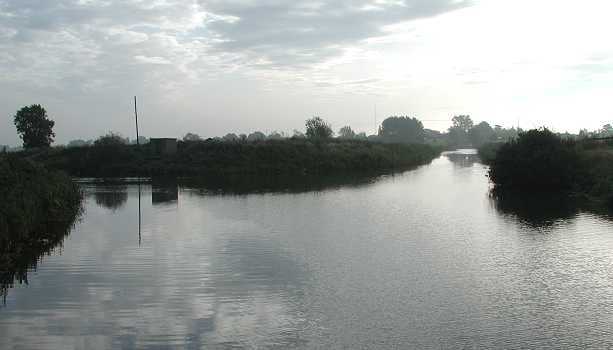 Fenton Lode, once navigable to Chatteris. Middle Level. Forty Foot Drain. Middle Level. Coming back to Puddock Bridge. Forty Foot Drain. Middle Level. Ramsey Hollow Bridge. Forty Foot Drain. Middle Level. Ramsey Hollow Pumping Station. Forty Foot Drain. Middle Level. Saunders Bridge. 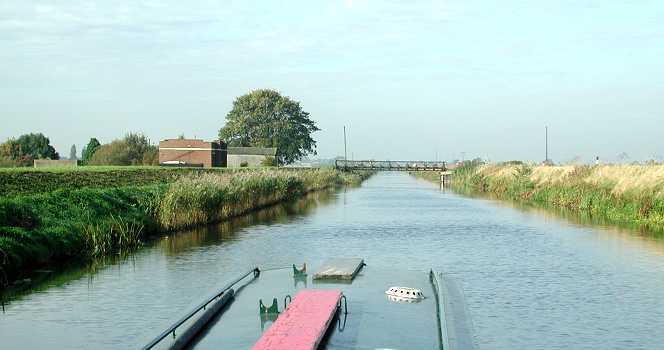 Lodes End Lock straight on and High Lode to Ramsey to the left. River Nene Old Course. Middle Level.